Do you use one of the most common lock PINs? Lockscreen PINs are a bit of a conundrum. On one hand, it needs to be convenient to enter, so you aren't fumbling every time you want to check your phone. But at the same time, it shouldn't be too predictable for snoops and thieves to guess. Daniel Amitay, the developer behind the 'Big Brother Camera Security' app, did some anonymous research on the app's users. Collecting the PINs of about 200,000 users, he found that a disproportionate number were using the same codes. 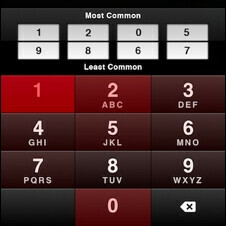 In fact, 15% of users were utilizing one of only ten possible codes. 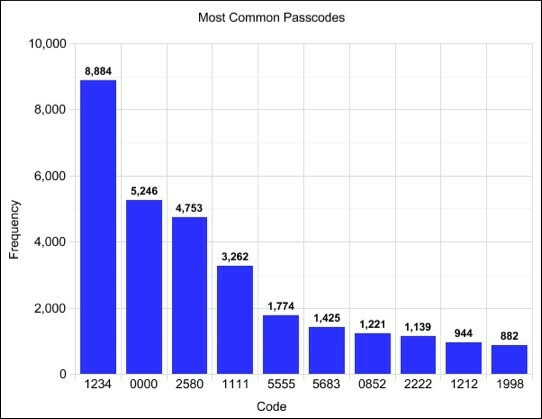 The top 10 most common codes were, in order, 1234, 0000, 2580, 1111, 5555, 5683, 0852, 2222, 1212, and 1998. In case you were wondering, the obvious outlier (5683) spells 'LOVE'. So why do we care? Well, the seasoned thief (or suspicious partner) now stands a reasonable chance (15%) of guessing your passcode, without prompting the device's automatic wipe. And we think that the broader population would use these codes more than 15% of the time, as the users in the survey were all security-minded consumers. Dude, it's super easy to unlock Android phones with the fancy lock. Its so much easier because the finger is never lifted up so it's really easy to watch as opposed to pushing four random buttons on a screen. And to be fair, I'm pretty sure there are very common unlock patterns. The most common ones (I bet) are zig-zag with an extra movement at the end or simply a circular motion. Thanks Phonearena.....so much for a secret. Good thing nobody told you guys about the Bin Laden raid. Why in God's name do people have 1234 as their lock code? That's generally the first code anyone would try. Might as well not have one at all. Does anybody know the significance of 2580??? I get all of them, but WTF is "1998"? Am I missing the joke here? It was the year 13 years ago. It's ok, it's a tough concept. I know it was 13 years ago but can we really narrow it down to 13 year old users? I'd think it is something else cause I doubt there are that many 13 year old users, and its a major coincidence so many would be born in '98.But ya this was a survey group of 200,000 users, guess I'd have to find out if those 882 (or about) people were 13 year olds. How is it a coincidence that so many 13 year olds were born in 1998? They were ALL born in 1998! if anybody is 13 years old now, they would have been born in 1998. Anyway, there are a great many smartphone users out there under the age of 18. I would presume the threshold is between 11 and 13 as the time when kids are allowed to have a smartphone. Personally, my 11 year old ain't gettin' a phone period until he gets a job. Even then I haven't decided if he'll get any kind of text/data package. These things are killing our kids.